I just hit my four-year mark in the software industry last Monday. Within these four years, I was able to overcome one of my weaknesses which is standing in front of other people and presenting myself or my work. It was during these time that I was able to face different people from different aspects of life -- like a president of a university, a CEO, a CTO, professors, lawyers, engineers like me and many more. With these people I've encountered, I was able to see different type of clients based on how they carry themselves during each meetings. Here are some notable characters that I'm sure some of you have already encountered. Take note that most of the meeting I'm attending are programming and technical related. These type of clients are really common. Often, they are characterized by a person on his forties, fifties and above, but not all. Some of them are just old fashioned who hates technology. These type of clients have lesser trust on technology. They believe that all their files should always be protected yet they want them to be online. Sometimes most of the complaints come from them. It would either be "I don't understand what you are saying" or "It's not friendly", worst is, "I didn't get it". There are also cases where in they will complain for things that doesn't match your job description. From my experience on web developing, most of them doesn't even know the meaning of "browsers". These are the types that act as if they know more than the developer. Well, basically, they should really know what they want but to go beyond what the developer use and asks things based on the books is something that really irritates me. They'll often asks for the language that will be used, the parameters, the safety measures that we'll be using, even the specs of the server or where it is located. Though I think these items are really important to ask, I'm pretty sure that soon enough you'll encounter a non-techie person asking you these things just because "they want to ask" and show that they know something -- and that is the point why I hate them. These people will often seek for your help to do a project they think they need, most of the time they're requests comes with the word "something like this...". Often times, idea comes from a site or place they saw somewhere over the Internet and think that it's good. The problem is, they don't even know how it works nor the business idea behind it. All they can see is the flow of cash they can earn once they have done it. What I really hate about these type of clients is they are passing the brainstorming of the business model to developers like us. Correct me if I'm wrong about this, but I think it is not included in a programmer's job description, rather, it is something that should be provided by the client to programmers and developers so they should have an idea on how to approach the project. These type is one of the worst clients in my opinion. They are the ones who want to work closely with the developers even though they also belong to the "The Old School" types. They always check from time to time the things that you are doing, and watches you with your every move. Though business wise, these types are really important too, the pressure that it gives to developers like me is simply one of kind that makes it harder to think. Developer need time to relax too and having these kinds of clients make me sick -- literally. Most of the time, you'll encounter clients from the other side of the world. Ever heard of the song "Jet Lag" by Simple Plan? One of the issue stated there is the difference in time zone. Adjusting your time depending on their time zone is sometimes irritating. 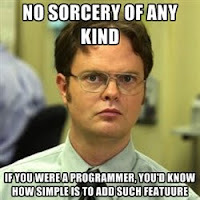 In my experience, since I'm a full time programmer who works for eight hours in a specific schedule, I really hate it when I need to ask them something. Usually I will send them an email at morning and they will answer the next day. This often cause an issue with the speed of development, well, unless if you are the type of programmer who knows how to decide for yourself without consulting the clients. Well these are just some of the clients I have dealt in my four years of work. There are more types than these but basically these are types that are remarkable and very common in my opinion. Actually, these types are common too in other industries aside from software development, worst is they come in different ages and forms! How about you? Which of these clients have you encountered? May mga clients nga na nagdedemand for something na d naman ksali sa job description or career mo. I've known some who asks me to do web designing, logo making, etc. - which is d ko naman talaga field. But because computer-related daw course ko, they're assuming that yakang yaka ko daw. Well described by you.... it was too humorous. i have also some kind of clients but i could successful to handle them anyhow. But really i liked the post.made me too laugh. What I hate most is the "Ms/Mr Know-it-All" who do they think they are? and share your ideas with them. Client: Amazing, let's try to add this feature in our system. and change request may mean additional costs. like this..." is and also warned him that this means costs, in a nice way. It's still part of your "software engineer" job title/description. are working in a consulting firm). This also varies from company to company.